We're back at it again for the 2019 season!! Young Artist is currently looking to hire judges for our 2019 season. If you or someone you may know might be interested in joining the YA staff, please send an email to admin@danceyoungartist.com. Lets thank our dance teachers today! What an awesome summer intensive series! We would like to thank each and every one of you for your support of Young Artist! Thank you to our host studios Katy Kress Dance Revolution, City Dance Center, and Dazzle Dance Center! You all were very welcoming and accommodating to our faculty and we hope to be back soon! We cannot wait to get working on competition season! We hope to see you in one of the cities in 2019! If you have any questions about competition, please feel free to message us here or email us @info@danceyoungartist.com. Some class photos from Natchitoches! Off to a great morning at Young Artist Natchitoches!! @momentsbyjed will having photo shoots this weekend in Natchitoches. Dancers registered for Young Artist Intensive will have the amazing opportunity to take photos with him this weekend! Here is our schedule for the YA Natchitches Intensive! Dancers can register at the door. Check in will begin at 830am. See you there!! 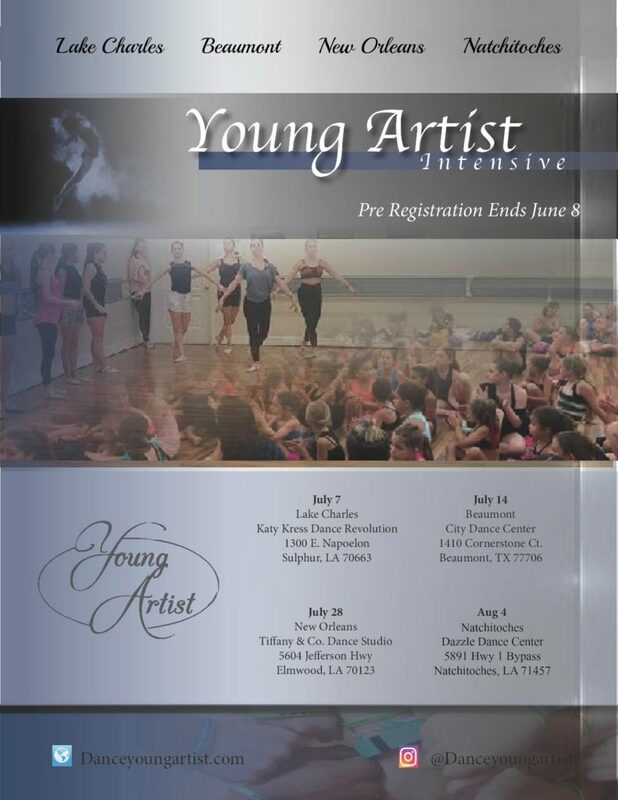 Here is the schedule for the Young Artist Intensive in Natchitoches on Aug 4th! Dancers can still register at the door! Check in will begin at 830am! See you there!!!! !